“Space Dealers," now streaming on Netflix, follows a trio of space memorabilia enthusiasts as they compete for, track down, buy and flip relics from space exploration history. "For the right price, America's leading space dealers will sell you anything and everything that the men and women with the 'right stuff' have used on their brave adventures in space," write the producers. Behind the scenes of "Space Dealers," Larry McGlynn (at right) and Chuck Jeffrey at the American Space Museum in Florida. "Space Dealers" lightly parodies the real-life trade in NASA artifacts and Soviet-era space hardware. The rivalry between bowtie-sporting Larry, former NASA employee Torie and well-connected Cole sets up the drama, but it is the objects that they handle and the astronauts who they visit who are the stars of the show. For example, in the first episode of "Space Dealers," Torie visits The Space Station, a collector-run museum in the San Francisco Bay Area, to see and source Russian spacecraft parts, while Cole encounters an Apollo-era rocket engine at Norton Sales in North Hollywood, a long-time supplier of aerospace props to the movie industry. Meanwhile, Larry is on the search for a NASA astronaut pin in order to reunite it with Apollo 15 command module pilot Al Worden, who appears in the episode. "Oh my gosh, my old silver pin! Where did you find that?" exclaims Worden, who earned his gold pin as he orbited the moon alone and went out a deep space EVA (extravehicular activity, or spacewalk) on the 1971 mission. Other astronauts who pop up on the show include Apollo 7's Walt Cunningham and space shuttle veterans Jon McBride, Scott Parazynski and Winston Scott. "Apollo, shuttle and International Space Station astronauts ... are the dealers' eyes and ears," the show's description reads. "They can verify items flown and they can describe precisely how they were used." Torie Lazaros with space shuttle astronaut Winston Scott and his flown hair comb in a scene from "Space Dealers." Over the course of the series' six hours, Larry, Torie and Cole crisscross the nation in search of space paraphernalia, entering collectors' homes, bidding at auctions and touring museums. Along the way, they do a bit of dumpster diving, taste a bit of space food, attend a NASA launch and hunt for fallen space rocks in the desert. The three dealers unearth artifacts that have been to the surface of the moon and turn them around for astronomical prices. "Buzz Aldrin's Apollo 11 personal preference kit bag that carried his Holy Communion wafer and cup to the moon is worth a cool six figures and even an old chunk of space soup, flown to the moon and back on Apollo 12, will set you back $40,000," writes WAGTV. In between the wheeling and dealing, "Space Dealers" offers a look at the history behind each piece, describing the artifacts' use and placing them into context with archival footage. Not every find is for sale and not every sale is a success, leading to the show sharing advice for those who may want to take up space memorabilia collecting as a hobby. Cole Sommers meets with shuttle astronaut Scott Parazynski while filming an episode of "Space Dealers." "Incredible stories from space, handling the rarest things to have left planet Earth and selling them for a fortune. All in a day's work for the Space Dealers," writes WAGTV. Disclosure: collectSPACE.com and its editor, Robert Pearlman, appear in episodes of WAGTV's "Space Dealers," now streaming on Netflix. 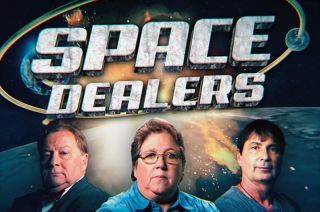 Watch the intro to "Space Dealers," now streaming on Netflix, at collectSPACE.